Today's post is a little news-ier than usual, which is quite exciting for me. The past week has been big in all kinds of spheres of my life. Friday was my last day of work at the museum, which has me feeling about eighteen different things all at once. I'm really going to miss the team there, even though moving on right now is a good and healthy thing for so many reasons. For now, I get to write a lot and explore what life looks like now as primarily a freelancer for the foreseeable future. And today I finally get to officially announce the arrival of a couple of things that have been stirring in the background over the past number of months, waiting until the right time to be launched out into the world. The time has finally come, and I'm thrilled (and also a little terrified!) to see what comes of them. Here's a bit of context: Tuesdays, in my experience, are the hardest days of the week. Everyone expects that a Monday is going to feel the way it does, with the lingering feeling that the weekend shouldn't be over yet. But Tuesdays sneak up on you. They tend to be the days when things break and people are unusually grouchy. Tuesdays are when strange things happen and you're not quite sure why things are as hard as they are, because it's not a Monday but there is still so much week left. By the time Wednesday rolls around, you're halfway there and the end is in sight. Thursdays are almost Fridays, and nobody hates Fridays. But Tuesdays... man, they'll get you every time. I don't want to hate Tuesdays, but I find that they're usually pretty rough. And I know I often need a reminder that it's just one day, that even the most Tuesday of days will not last forever. That's why I'm launching the Real Talk Tuesday Newsletter, designed to be a bright spot in your email inbox first thing every Tuesday morning, with what will hopefully be timely reminders that things tend to turn out better than they might seem to early on in the week. Starting this coming week, the first Tuesday of July, you can receive a little piece of my heart direct to you. An overly perky, flowery piece that tries to convince you to forget all your problems. That's not who I am, and that's not usually helpful for most of us anyway. A lecture designed to make you feel bad about yourself or like you're not trying hard enough. There's enough of that in the world, and demeaning advice doesn't ever do any good. Practical conversation about the ways that life has been hard in the last week. Simple reminders that point to the things that are good. Probably some really bad jokes. And here's something else I'm really excited about: the launch of this newsletter is also the launch of a seven day devotional on joy! In case you hadn't already noticed, God has made carrying joy into the lives of my people a huge part of my personal mission. It's a large part of the story behind the name of this website and has been a huge theme of the past several years of my life. God laid this devotional on my heart about a year ago, and I've been slowly working on it since then. Now it's finally ready to be seen by the world, and I couldn't be more excited to share it with you. When you subscribe to the Real Talk Tuesday newsletter, you will receive a copy of it for FREE. My hope and prayer for this devotional is that people would read it and be encouraged to meet Jesus in the middle of whatever chaos life has brought their way. So if a weekly pep talk and a free devotional sounds like a winning combination, this is the deal for you. 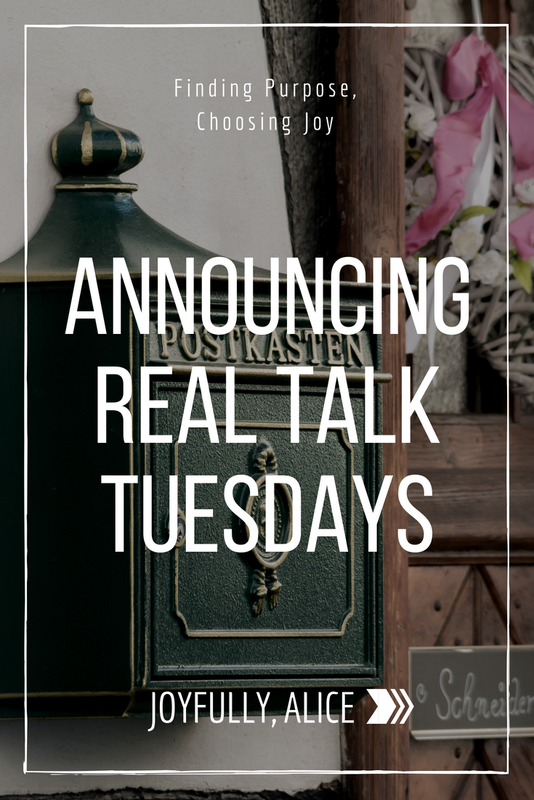 Follow the subscription instructions on the side or bottom of the page and you will receive Seven Days on Joy and Real Talk Tuesdays in your inbox starting this week. So here's to Tuesdays, and to choosing joy in spite of it all!